While the holiday season can be the most magical time of the year, it can also be one of the most dangerous times for pets. Christmas and other holidays can introduce new risks into your home in the form of festive decorations and delicious holiday meals. While these aspects of the holiday may be some of your favorites, it’s important to understand what threats that they pose to your furry companions. Avoid adding tinsel to your tree as this can be very dangerous if swallowed. 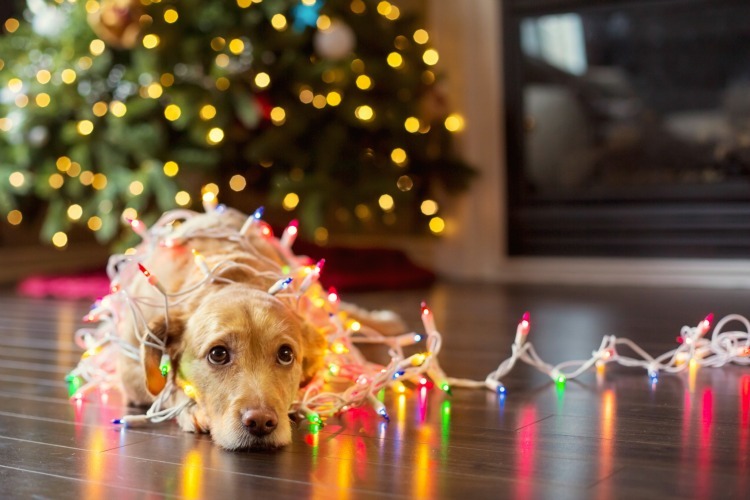 Don’t put Christmas lights on your tree’s lower branches to avoid having your pet get tangled in them or even getting shocked from chewing on them. Ornaments should also be left off of the lower branches as they can cause choking and intestinal blockage if swallowed. 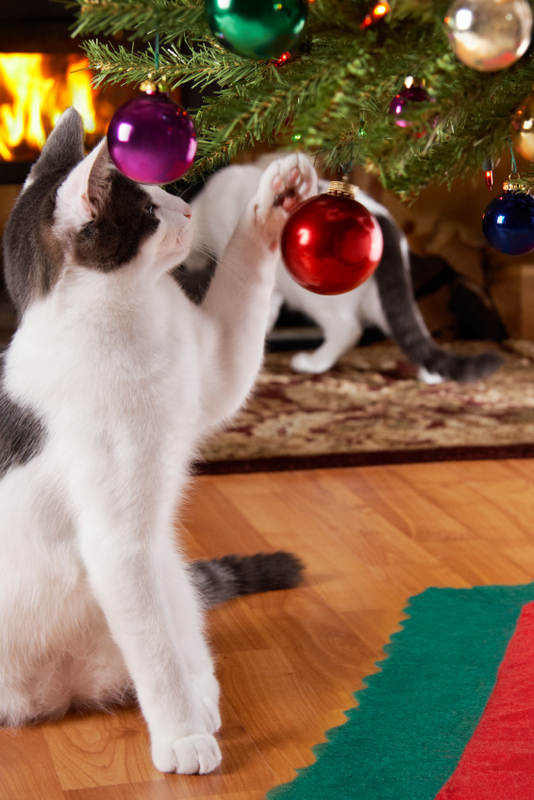 Broken ornaments can also lead to cuts on your pet’s paws and should be cleaned up right away. If you have a real Christmas tree make sure that your pet is not drinking the water at the base of the tree. 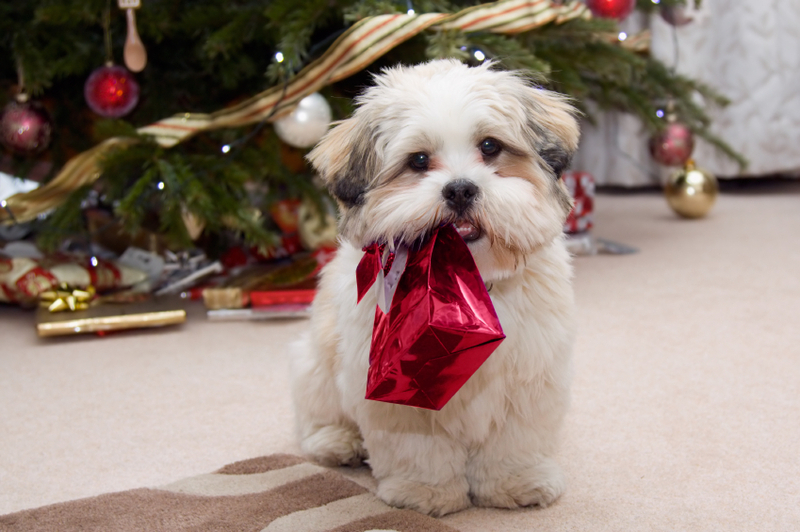 When wrapping your holiday gifts be sure to keep wrapping paper, bows and any other plastic material away from your pet’s reach. The same goes for when you’re unwrapping. If you love wrapping up your pet’s Christmas presents then consider a dog-friendly wrapping paper which features soy-based inks and non-toxic chemicals. 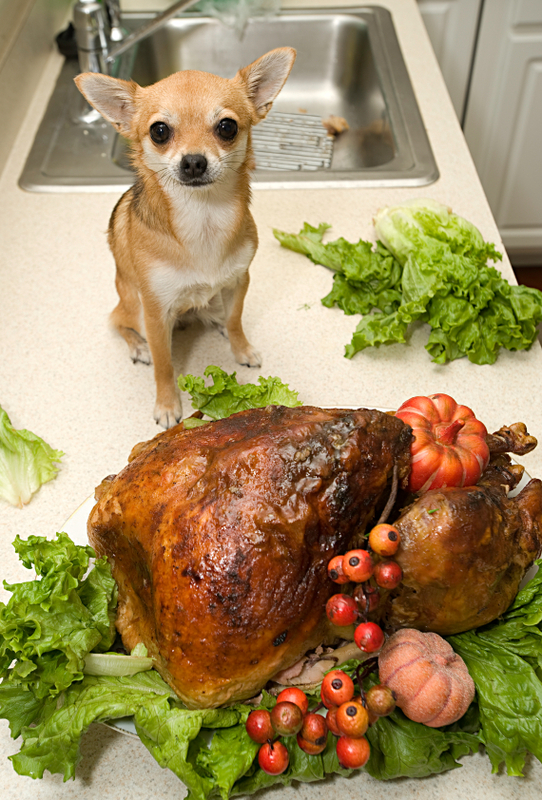 While it’s tempting, don’t feed your pet scraps of rich fatty foods such as turkey skin and gravy. This can cause pancreatitis which is an inflammation of the digestive gland and can often result in hospitalization. When it comes to table and holiday décor be sure to keep burning candles high up and away from wagging tails or precious paws. Another solution is to decorate with flameless candles which comes in a variety of sizes and styles. After a meal it’s important to dispose of all garbage or “leftovers” properly as certain foods can make your pet sick. This is especially important when it comes to bones from a holiday turkey, which when swallowed, can lead to serious internal damage. Whether you’re a new or experienced pet owner, it’s always a good idea to brush up on the most common threats to your furry companions during any season. If you believe that your pet has ingested something poisonous or something that could be causing intestinal obstruction, please contact your vet immediately. Meow-y Christmas & Happy Howlidays!